Since all of us are created differently and are unique in our own right, it goes without saying that sometimes, there will be parents out there who wonder how come their three kids, despite sharing the same biological raw material, are all so different from one another? Regardless of that, one thing remains the same – kids can be notoriously difficult to feed, and it will be a battle of the wills (and wits), too, in the more extreme cases. Why not make things more fun at the dining table with the $18.99 Dinner Winner Plate? 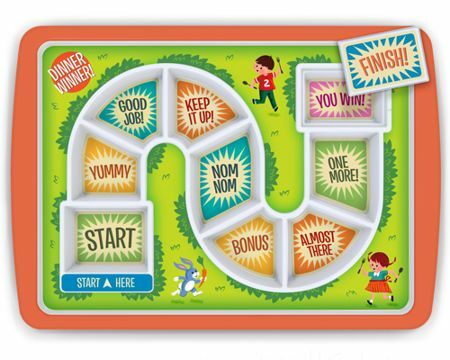 The bright and colorful Dinner Winner Kids Plate is a surefire winner by making meal times fun for your little one. It has been specially designed to look like a board game, where you might just see kids race one another to the dinner table. The Dinner Winner Plate will set a goal before the hungry youngling, which is to arrive at the finish line where a special hidden treat awaits. There are places such as Mashed Potato Mountain, Broccoli Forest, and the Valley of Brussels Sprouts to go through though.